This is a very sad day. Very. I finished the last book in the Christiansen Family Novel series by Susan May Warren. 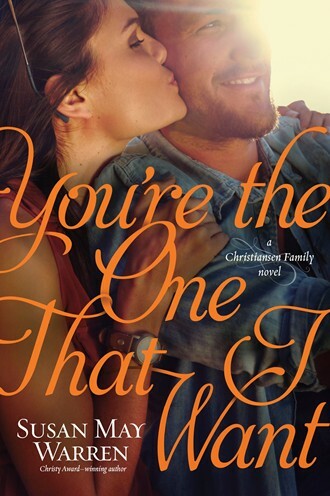 You're the One That I Want is a perfect last book in this series, but that doesn't mean I have to be happy about seeing the series come to an end. Every time I review one of Susie's Deep Haven books -- books that are set in the fictional town of Deep Haven, Minnesota -- I talk about how well she writes Minnesota. Reading this series is like catching up with old friends. 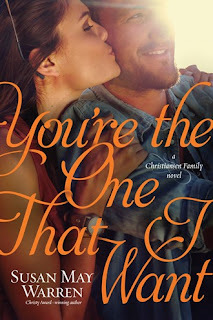 This series has focused, one sibling at a time, on the Christiansen family. Over the course of the previous five books, Owen has been set up as a pretty messed up young man. He took off a couple of books back, and hasn't let anyone know what he is doing or if he is okay. My favorite characters are still Ingrid and John, the parents of the sibling 'stars' of the series. But I found myself, for the first time in this series, liking Owen as well. Owen Christiansen has been in a downward spiral since an injury ended his NHL career. But a job on an Alaskan crabbing boat offers a fresh start . . . maybe even a shot at romance with Elise “Scotty” McFlynn, the captain’s daughter. Used to being one of the guys, to never relying on anyone, Scotty doesn’t believe in happily ever after—especially with someone like Owen. Her instinct is confirmed when Casper Christiansen arrives to drag his prodigal brother home, bringing with him a truckload of family drama—and even worse, the news that Casper is wanted for questioning in connection to a crime back in Minnesota. But Owen is more than the sum of his mistakes, a truth both he and Scotty discover when she escorts both brothers to Deep Haven as part of her new job on the Anchorage police force. Thrust into an unfamiliar world of family, faith, and fresh starts, Scotty begins to see potential for a happy ending . . . if she’s brave enough to embrace it. I highly recommend this series, but I do not recommend starting with this book. I'm sure it does stand alone, however there is just too much backstory that you'd be missing. Start with Take a Chance on Me, which I have to confess, is my least favorite in this series. But it sets it all up. A major theme in this book relates to the prodigal-ness of Owen and whether or not he can accept the totally undeserved grace offered by God and offered by his family. But it isn't just Owen facing some of these issues, it is something they -- we, really -- all need to process. Susan May Warren always makes me think. My best friend started telling me how amazing Demme Learning's Math-U-See was a long, long time ago. Hands-on, with manipulatives, and Steve Demme just makes so much sense, she told me. I was happy with what we were already using, so I didn't pay a whole lot of attention. Different kids, though, often need different approaches. A few years ago, I did jump in and it was the best decision I could have made for my younger kids. Now that they have introduced digital math with their Digital Packs, I have gotten my eldest to try it out too. For this review, he has been working through PreCalculus. Is it just me, or is the very sound of the word PreCalculus intimidating? I did go through Calculus once upon a time, but that was a very long time ago and I'm not making any claims that I remember much. Mr. Demme makes it so I don't have to figure out again. Math-U-See is so easy to use, especially with my teens. Connor watches the video, does a worksheet or two, depending on whether this is a new concept or one he already knows, and moves on. The newest thing from Math-U-See is the Digital Pack, which comes with the Universal Set and can also be purchased separately. I wasn't entirely sure about this, but it turns out that we love it. So what do you get? You get 12 months of access to the Digital Pack. You can stream all of the content from the DVDs. You can access a pdf of the student textbook, listed as a Lesson Summary here, and as the Instruction Manual for the physical textbook. 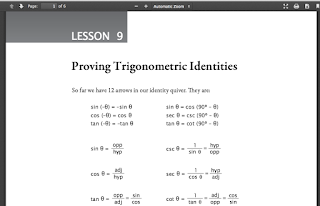 You can check out the solutions for the worksheets, quizzes, and tests. You have access to a record-keeping sheet that can be used in tracking grades. You have easy access to additional MUS resources. For lower levels, you can also access digital manipulatives, but there aren't any at the PreCalculus level. You need decent internet to access the streaming. The Digital Pack does not include the workbook or tests. We are loving this. Connor does not have to tie up the television to watch math. 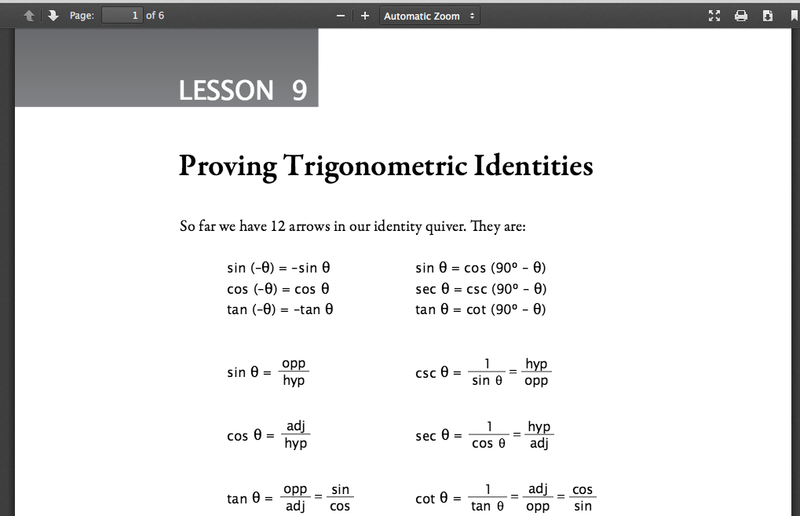 Some of the lessons are pretty long at this level (Lesson 9, Proving Trigonometric Identities, is over a half hour) and he has four younger siblings who also need the television for various schoolwork. Connor being able to stream his math video frees the rest of us up. He prefers the short pdf file for each chapter of the text as well, like the one at left. He doesn't have to keep track of the book, nor try to keep it nice for his siblings. He can easily access it from any internet device, so dragging a big textbook around is something he can avoid. I can pull up the solutions, and let me tell you, the solutions book is something I can never keep track of. Now I don't have to. However, my only real complaint about the Digital Packs is that the solutions are all right there, easy to access for anyone. I've been told they are working on that, so those will need a separate password or something, but as it stands at this time, the student has easy access to all of the answers. Bottom line: the Digital Pack is making it so easy for math to happen for him. As I get to the end here, I realize I didn't even touch on what is covered in this course! 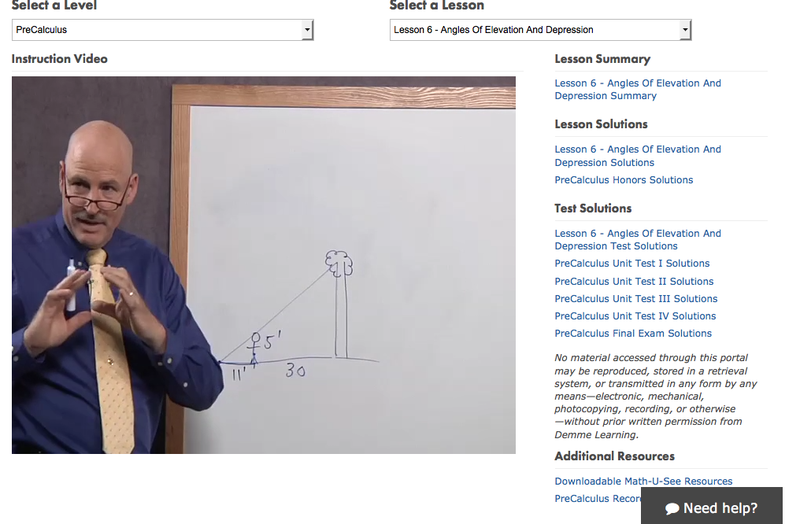 Back when I was in high school, there wasn't a "PreCalculus" course. After Algebra 2, we took Trigonometry for a semester, then Analytical Geometry. Calculus came after that. I've always been a little confused as to what exactly PreCalculus even is, but going through the Math-U-See version, it seems it could just as easily be titled Trigonometry. 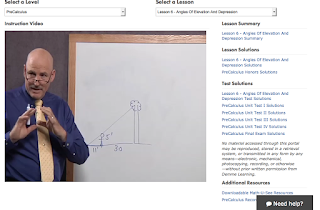 The first lesson, in fact, is called "Introduction to Trigonometry" and it proceeds to go through all kinds of lesson titles with words like "Angles," "Sine," "Cosecant," and "Logarithm." I keep thinking I need to work through the videos myself, just to see if Mr. Demme can get me to understand all of this again. Well, umm, actually, to understand it at all. The first time through, I could process the stuff enough to get As and Bs in class, but I certainly never understood it. Members of the Schoolhouse Review Crew had the chance to review Math-U-See levels from Primer all the way up through PreCalculus, as there isn't a Digital Pack for Calculus quite yet. Definitely go and check those reviews out so you can see how this worked in other households and with less complicated math! For the past couple of months, I've been picking up The Case for Hope by Lee Strobel. Reading. Re-reading. Re-re-reading. But not writing a review. Well, today is that day. Merriam Webster defines hope as "to want something to happen or be true and think that it could happen or be true." I don't much like that definition. And that isn't the hope that Strobel is making a case for. Going back to the Hebrew and Greek, this word "hope" is more of a confident expectation. Or trust. Hope is more than a wish. It is true. It is real. Lee Strobel’s trademark investigative style relays the confidence to know that hope is found in Jesus Christ. This book shows how living with hope makes a life-changing difference each day. Can you really trust in hope? Lee Strobel proves that you can! Lee Strobel’s trademark investigative style paired with an uplifting message of the hope found in Jesus Christ makes this the perfect gift for any Strobel fan at any time of year. Lee’s timeless message walks readers through why holding on to hope is so crucial, why we can trust in the hope of Jesus Christ, and how that hope can change their lives for the better. Lee Strobel has already helped millions delve deeper into their faith and investigate the how and the why of what they believe. His cases for a creator, Christ, and faith are air-tight and convincing to even the most stalwart skeptic, which is why we know that The Case for Hope is sure to inspire and ignite hope into the hearts of those who thought they were without hope. This gift book will be the perfect present for any occasion—be it a holiday or just as a pick-me-up for someone struggling. As anyone reading this blog already knows, my mom died a bit over a year ago. This book arrived in my life in mid-December, right before Christmas. A season of hope. And my first Christmas without Mom. I didn't expect it to be all that hard. The last time I saw Mom at Christmas was 1993. I figured the holiday was going to be a lot harder on Dad and my brothers. But it turned out that so much of Christmas has my mom wrapped up in it. The nativity scene she made. Her fudge recipe. Her peanut brittle recipe. Ornaments we made together when I was a kid. The stockings she made. It was much harder than I ever thought it would be. And it was right as I was realizing that Mom is part of my Christmas even when she was 1000 miles away that this little book showed up in my mailbox. This is an easy book to read. It's a nice gift-book size and feel. And it has a great message. My big takeaway was that it is okay for me to have questions and to have doubts. And that there are reasons for hope. A year ago, I was in the middle of planning a funeral. We drove 1000 miles, through a blizzard, to get there. I worried about whether Mom's brother and sister would get along with each other for the day. I sat up and drank wine with Dad pretty much every night I was in Fargo. Oh, who am I kidding? I find myself thinking about it as I've started slipping up again and talking to the kids about "Grandma and Grandpa, uh, I mean Grandpa." Like when ordering a diploma for Connor. Mom would have loved to see him graduate. That's Mom & Dad, and I assume Mom had just gotten her master's degree. In Entomology. If I'm right, that would be the house where we lived when I was born. Not that I remember it at all, but I've been told it was tiny. 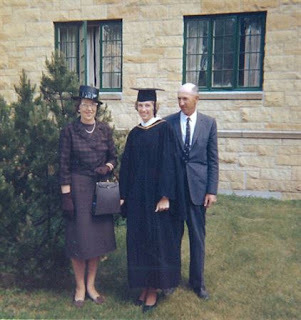 Education was hugely important to Mom, and she was who I always talked to when I was trying to sort things out with this whole homeschooling gig. Mom would have been a great homeschooling mama. It's something I've thought often. But especially as I was ordering a diploma for Connor. Does it sound like this whole diploma thing is freaking me out a wee bit? That would be because it is. Anyway, Mom was the one going into the school library and arguing that I had been reading for two years, had already read the entire Little House series more than once, and I really should be allowed to check books out from the library that actually had more than two words to the page. And she was in there trying to get them to let me check out biographies a couple years later. She lost that battle, though, so she started taking me to the public library downtown. And there she was able to get them to let me check out any book I wanted. We'd do read-alouds over the summer. We'd hit all kinds of historical sites when we went on family vacations, along with zoos and a whole lot of the great outdoors. She found someone to teach me to crochet after Grandpa (Dad's dad) died. He had taken up crocheting after a heart attack and had started teaching me. She proceeded to find someone to teach me to tat. Education was a big deal. 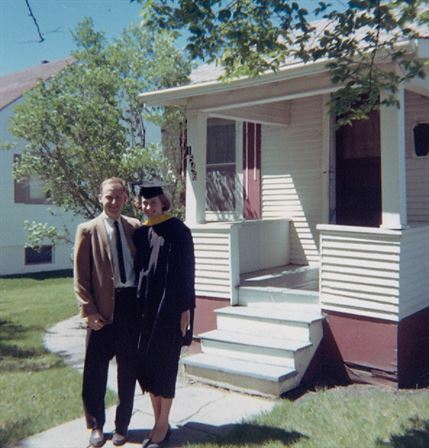 That's her getting her Bachelor's Degree in Biology from Gustavus. I assume. It can't be a high school graduation photo. Love Grandma's hat and gloves.